Internationally acclaimed for his portraits of powerful and accomplished people and women of great beauty, Richard Avedon was one of the twentieth century's greatest photographers-but perhaps not the most obvious choice to create a portrait of ordinary people of the American West. Yet in 1979, the Amon Carter Museum of Fort Worth, Texas, daringly commissioned him to do just that. The resulting 1985 exhibition and book, In the American West, was a milestone in American photography and Avedon's most important body of work. His unflinching portraits of oilfield and slaughterhouse workers, miners, waitresses, drifters, mental patients, teenagers, and others captured the unknown and often-ignored people who work at hard, uncelebrated jobs. Making no apologies for shattering stereotypes of the West and Westerners, Avedon said, "I'm looking for a new definition of a photographic portrait. I'm looking for people who are surprising-heartbreaking-or beautiful in a terrifying way. Beauty that might scare you to death until you acknowledge it as part of yourself." 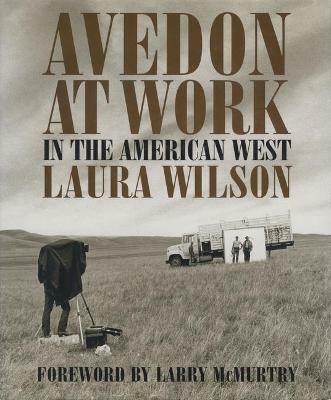 Photographer Laura Wilson worked with Avedon during the six years he was making In the American West. In Avedon at Work, she presents a unique photographic record of his creation of this masterwork-the first time a major photographer has been documented in great depth over an extended period of time. She combines images she made during the photographic sessions with entries from her journal to show Avedon's working methods, his choice of subjects, his creative process, and even his experiments and failures. Also included are a number of Avedon's finished portraits, as well as his own comments and letters from some of the subjects. Avedon at Work adds a new dimension to our understanding of one of the twentieth century's most significant series of portraits. For everyone interested in the creative process it confirms that, in Laura Wilson's words, "much as all these photographs may appear to be moments that just occurred, they are finally, in varying degrees, works of the imagination." Reviewed in the 23 April 2004 Times Literary Supplement (nothing quotable). Laura Wilson is a photographer whose previous books are Hutterites of Montana and Watt Matthews of Lambshead. Her work has also appeared in the New York Times Magazine, the New Yorker, the Washington Post Magazine, and London's Sunday Times Magazine. She lives in Dallas.